There seems to be more than a few computer science/programming Stack Exchange networks (is that the correct term?). Stack Overflow, being the first, has by far the most users, questions, and answers. What is the reasoning for creating the others, and are there clear guidelines for which kinds of questions should be posted? I can see a large amount of potential overflow, many cases of people not getting a good answer to their question, because the person who has the answer isn't browsing that particular network at the moment. I understand that they were probably created for organizational purposes, but wouldn't it almost make more sense to just have them as categories under Stack Overflow, keep them separated but still connected, instead of making people have to create multiple 'account's, one for each network? I am sure there was a very good reason to break them up, but as someone that is new to SE, it can be somewhat intimidating to decide which one to post in to ensure you get a good answer. For example, if I am a computer science student, my first instinct might to be to post in the computer science network, until I see that it literally has 1% of the users as the Stack Overflow network, which still seems to be for programming/computer science related questions. So my second instinct would then to be to post it into the Stack Overflow site on the basis that I have a significantly higher chance of my question being seen and getting a good answer. 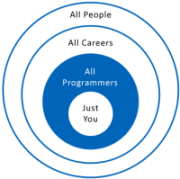 Then I notice that there is also a 'programmers' network, and I don't even begin to know where that fits in. I, and I am assuming most people, will probably just post on Stack Overflow to be safe. My question is, other than the short little description blurb of each one, is there a clear cut set of guidelines which what each network is intended for, what kinds of questions should go to each one, and is anything being done to encourage people to post in these newer, smaller (more specialized?) networks as opposed to just posting in big daddy Stack Overflow? Now again, this is for computer science/programming/"why isn't this code doing what I want?" related questions, I am not saying that if I had a question about Linux or WordPress or something I would have the same confusion. First, make sure you're asking a good question. Some questions are off-topic everywhere, and there's no guarantee that any site exists that will take your question. Have a specific problem statement, tailored to the site you intend to post to. Don't ask for lists of things. Don't require extended discussions or lengthy explanations. …then you’re in the right place to ask your question! …then you're probably in the right place to ask your question. Database administration, querying, modelling, including programming in built in server side languages (think: stored procedures). Everything that has to do with Information Security excluding the deeper aspects of cryptography and setting up your home antivirus. security - "Have I covered the bases?" efficiency - "It does the job, but can it go faster or is there a better way?" maintainability - "It works now, but will I run in to problems down the road?" edge cases - "Are there situations in which the code will break?" If your code is not yet producing the output you require then the code is not ready for review. If you need help getting the code to a completed state and you have specific questions about how to do that, then Stack Overflow is the right place to ask. Questions about the actual process of code reviews are off-topic and better suited for Software Engineering. For questions about computer science, as in the academic discipline. As a rule of thumb, if your question depends on real-life languages/code/hardware/..., ask on Stack Overflow; if your question calls for abstract/mathematical models and reasoning, ask on Computer Science. Algorithms expressed in pseudocode straddle the border. For questions about theoretical computer science at research level. If you aren't at least a graduate student, see Computer Science. For questions about education within the context of computer science. The typical site user teaches computer science. Self-learning questions about designing a course of study or an approach to a topic are also possible here, but this site is not meant to teach students about CS directly. SQA focuses on software testing questions, which run the gamut from technical queries about implementation of your automated tests, to organisational questions like planning training for your test team, or even how you go about persuading your manager to actually hire some professional testers instead of just crossing his/her fingers and hoping. It's aimed at professional software testers, and other related roles (programmers, business analysts) who perform software testing as part of their profession. That's easy, just browse through their challenges and you'll get the idea. Not for general programming questions, but for challenges for people to answer (in code of course). Challenges must have an objective winning criterion, generally code-golf, and clear specifications. All of the above should be to be applied on a specific web application of your choice. NOTE: Questions about web application design/deployment/hosting are offtopic. Unix and Ubuntu: Why Both? How to make our cs community very different from the cstheory? What is the history of the Computer Science site? Not the answer you're looking for? Browse other questions tagged discussion faq stack-exchange site-recommendation . Is there a Stack Overflow like site for computer science? Where to ask a question about an IDE? If I had a question with Excel, which site would I use? Which site for database design questions? Which Stack Exchange site is best for Microsoft Excel questions? Where should I ask software architecture / design questions? Where can I ask questions on cloud computing?